Columbia Police Chief Skip Holbrook announces that Investigators are releasing a composite sketch of what an armed robbery and assault suspect may look like. 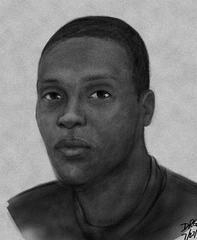 The sketch comes courtesy of the SC Law Enforcement Division (SLED). CPD Investigators want to find two armed men who forced their way into a female victim’s Adger Road home around 11:30 a.m. on July 24, 2016. One of the suspects is accused of knocking the victim to the ground and holding her at gunpoint while the other suspect rummaged through her home. The victim suffered non-life threatening injuries to her arms, leg and back. She received medical treatment once police and EMS were dispatched to the scene. The men are accused of stealing several of her belongings including a purse and cell phone. TEXT to CRIMES (274637), and mark the beginning of the message with "TIPSC,” followed by the tip information. LOG onto: www.midlandscrimestoppers.com, and click on the red "Submit a tip” tab. Tipsters could earn a cash reward of up to $1,000 for information leading to the arrest of the suspects.